On June 30, at Miyamori Elementary School in Ishikawa, Uruma, pupils offered flowers and origami cranes to Nakayoshi-Jizo. Fifty-seven years have passed since June 30, 1959, when a U.S. F-100 fighter, which was poorly maintained from Kadena Air Base, crashed into Miyamori Elementary School in Ishikawa City (currently Uruma City). 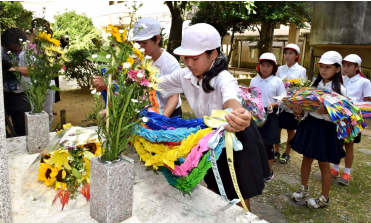 The Ishikawa and Miyamori 630 Association and the bereaved family association held the 57th anniversary memorial ceremony on June 30 at the school. Participants paid their respects to the 18 victims. They had a moment of silence at around 10:40 a.m., which was the time when the aircraft crashed. About 100 bereaved family members, people who were pupils at time of the crash, and local residents attended. Prior to the ceremony, the school’s student association held a ceremony to pay tribute to the memory of the victims. Representing the students, 11 year-old Karen Igei who chimed a peace bell, said, “I want the victims to rest in peace.” During the ceremony, U.S. military aircraft generating loud noise flew over the pupils taking part.